Procedures – Yes International, Inc. Your EDGAR solution begins when you send us your approved document via E-mail, along with your Company’s CIK and CCC codes. We accept all Microsoft Word, and Microsoft Excel formats. 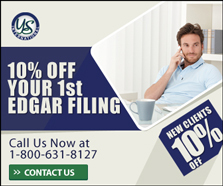 If you do not have your filing codes, you can obtain them by allowing YES EDGAR to complete a Form ID. Once we have received your filings, we will immediately begin preparing the document for SEC acceptance. The length of time it takes to complete a filing varies depending on the format of the document and the amount of changes required once we receive it; however, most filings are ready for proofing within several hours or less. Your prepared EDGAR documents will be faxed or emailed to you for final approval. If you have any final revisions or edits at this time, we will process them accordingly. Once the files have met your approval, the document will be electronically submitted to the SEC. As soon as we receive a confirmation from the SEC, the Acceptance of the filing will be forwarded to you.